Two recently appointed Adult Volunteers from 2505 (Bishop Auckland) Squadron Air Cadets have attended and successfully completed the SNCO Staff Initial Course (SSIC) at the Adult Training Facility at RAF Cranwell. Sergeant (ATC) Caroline Hodgson and Sergeant (ATC) Malcolm Edwards took part in the week-long course along with other newly appointed Non-Commissioned Officers (NCOs) from around the country. They were taught how to instruct drill and other subjects, as well as developing their knowledge of safeguarding, and their own personal leadership skills. “‘The course was very good with open and honest discussions facilitated by experienced staff. The challenges presented throughout the intensive week enabled us to develop as leaders within the Royal Air Force Air Cadets,” said Sgt Edwards. 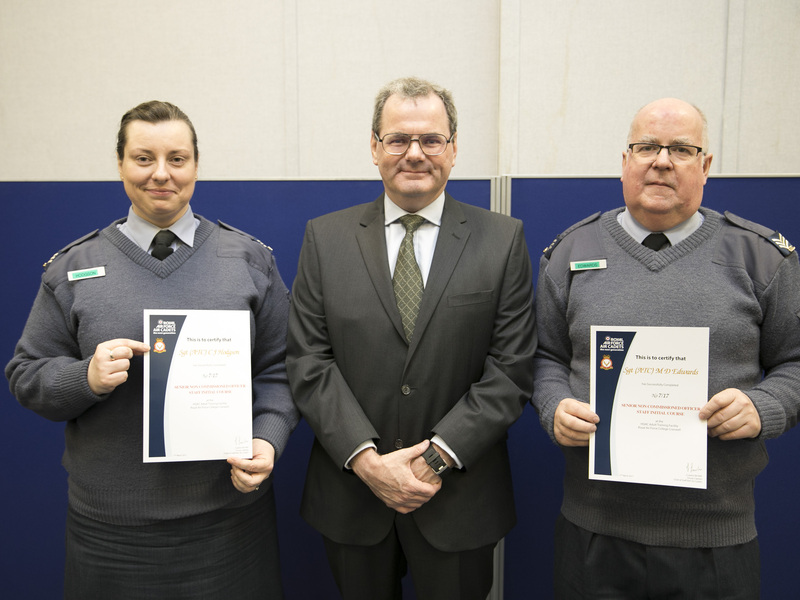 The pair’s CO, Flt Lt Ian Pepper, travelled down to Lincolnshire to be present at the formal parade at the end of the course, and to see them presented with their certificates. All uniformed adult staff in the RAF Air Cadets spend time at RAF Cranwell to develop their knowledge and understanding of our organisation and its aims.